To begin adding fields, go to the Reports > Advanced Reports section and edit the report you need by clicking the pencil icon next to it. Next, look at the upper left corner of your report screen and find your Domain. Click the pencil next to it to reveal an option to add new fields. Available fields - contains the fields that are available for you to add to the report. Selected Fields. - contains the fields that you have selected to use within the repoirt. 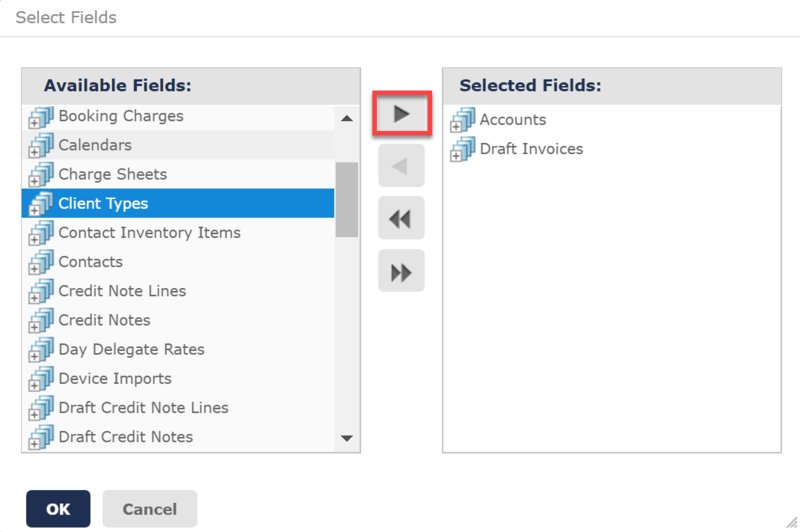 To add a field module to your report, click to select one under Available Fields, then click the right side arrow to send the field to the Selected fields list. Use the double arrow button to add all fields. 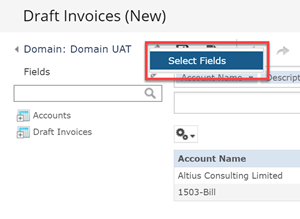 Use the arrows towards the left to move fields from under Selected fields back to Available fields and remove them from the report. Once your field module has been added, you can now expand it by double clicking it in the list on the left side of your screen - this will allow you to select from several of the fields it includes. Right click a field to reveal a menu that lets you add it to your report as a column, group, filter or sorting criterion; as well as to add it as a measure, if it has a numerical value. To add a column to your report, either double click the field you want to insert as a column, or right click it then select Add as Column. Your field will be inserted into the top fields list, as well as within your report preview. You can click and drag its name on the top bar to move it left or right. You can also place it on the group fields bar to turn it into a group. This will split your data into different groups, depending on a set criterion. 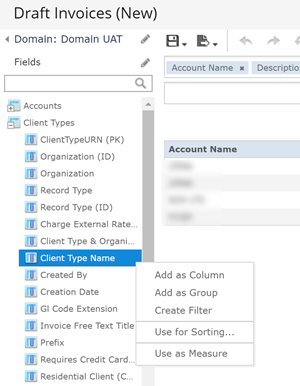 You can add a new group by right clicking a field in the list, then selecting Add as Group; or by dragging a column field from the top bar to the bottom group bar. To use a field as a filter, right click it in the list on the left, then select Create Filter. This will create a filter on the right side of your screen, which will narrow down your data according to the field you're using as a criterion. To do this, right click the desired field in the list on the left and select Use for Sorting. This will not add the field to your report, but will sort the data according to it, in an ascending order. You can change the sort order by selecting other fields or columns visible within your report.